SOUTH BEND – Notre Dame has plenty of experience playing in games featuring the top two teams in the country. Before tonight, it just didn't have a lot of experience winning them. The No. 1 Irish's 72-68 victory over No. 2 Louisville was the eighth time Notre Dame had played in such a game, but only the second time it had emerged with a victory. The first win in such a game came in the 2001 Final Four, when Notre Dame defeated Connecticut on its way to a national title. Thursday's matchup against the Cardinals didn't have quite the same stakes, but for these teams, there was plenty for which to play. Both head coaches emphasized after the game that there are more important matchups to come in March, but it was clear both teams had a little extra juice for this one. The game was much closer than its 14-point final margin would indicate and it was anything but assured for the Irish down the stretch. Several times in the fourth quarter, it looked like Notre Dame would pull away, but the Cardinals responded every time, culminating in an 8-0 run in the final minutes that cut the Irish lead to two points with 2:39 left. Notre Dame called a timeout and then went to (who else?) Arike Ogunbowale, who buried a tough fadeaway jumper. She later added a 3-pointer that put the game out of reach, eliciting a massive roar from the near-capacity crowd. After Louisville held her to just four points in the first half, Ogunbowale wouldn't be denied down the stretch, pouring in 26 second-half points to give her her fifth 30-point performance of the season. It wasn't all Ogunbowale, however. Brianna Turner added 16 points and six rebounds, while Jackie Young chipped in 14 points, six rebounds and five assists. Possibly the biggest difference-maker was Jessica Shepard, who pulled in 15 rebounds, including 13 in the first half to help keep the Irish in the game. 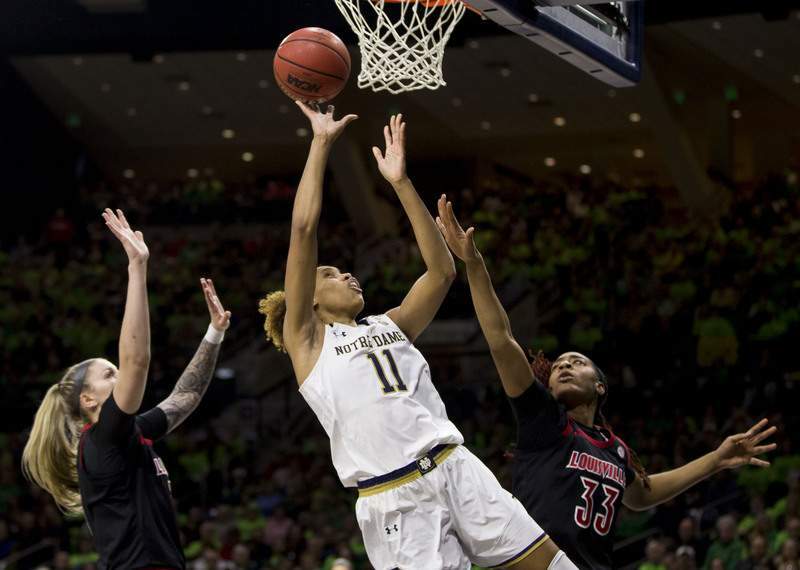 If Shepard hadn't been keeping Louisville off the glass while Notre Dame was shooting 14 percent in the second quarter, the Cardinals might have opened up an even bigger lead than the seven-point maximum they managed. The Irish won this game, but the Notre Dame-Louisville war will go on. The teams will most likely meet again in the ACC Tournament and possibly in the NCAA Tournament with even more on the line. They're evenly-matched groups and every game will be a battle. This round goes to the Irish. So does the top ranking. After the game, the Irish got one more piece of good news. Former Notre Dame star Ruth Riley was named a finalist for the Women's Basketball Hall of Fame's Class of 2019. Riley was a two-time All-American with the Irish and was the National Player of the Year in 2001, when she led Notre Dame to an NCAA Tournament championship.